examples of audio technology beyond the scope of MPEG-7. 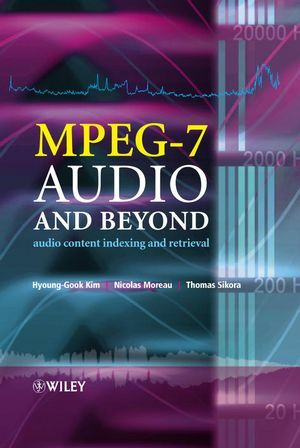 Essential reading for practising electronic and communications engineers designing and implementing MPEG-7 compliant systems, this book will also be a useful reference for researchers and graduate students working with multimedia database technology. 1.2 MPEG-7 Audio Content Description – An Overview. 1.2.3 MPEG-7 Description Definition Language (DDL). 1.2.4 BiM (Binary Format for MPEG-7). 1.3 Organization of the Book. 2.2 Basic Parameters and Notations. 2.10 Beyond the Scope of MPEG-7. 3. Sound Classification and Similarity. 3.2.1 Singular Value Decomposition (SVD). 3.2.2 Principal Component Analysis (PCA). 3.2.3 Independent Component Analysis (ICA). 3.3.1 Gaussian Mixture Model (GMM). 3.3.2 Hidden Markov Model (HMM). 3.3.4 Support Vector Machine (SVM). 3.4.1 MPEG-7 Audio Spectrum Projection (ASP) Feature Extraction. 3.4.2 Training Hidden Markov Models (HMMs). 3.5 Comparison of MPEG-7 Audio Spectrum Projection vs. MFCC Features. 3.6.1 Audio Retrieval Using Histogram Sum of Squared Differences. 3.7 Simulation Results and Discussion. 3.7.1 Plots of MPEG-7 Audio Descriptors. 3.7.3 Results for Distinguishing Between Speech, Music and Environmental Sound. 3.7.4 Results of Sound Classification Using Three Audio Taxonomy Methods. 3.7.5 Results for Speaker Recognition. 3.7.6 Results of Musical Instrument Classification. 4.2.2 Types of Speech Recognition Systems. 4.4 Application: Spoken Document Retrieval. 4.4.1 Basic Principles of IR and SDR. 4.4.4 Sub-Word-Based Vector Space Models. 4.4.6 Combining Word and Sub-Word Indexing. 5.4.3 Comparison of Melody Contours. 6. Fingerprinting and Audio Signal Quality. 6.2.1 Generalities on Audio Fingerprinting. 6.2.3 Distance and Searching Methods. 7.2.6 Hybrid Segmentation Using MPEG-7 ASP. 7.3 Sound Indexing and Browsing of Home Video Using Spoken Annotations. 7.3.1 A Simple Experimental System. 7.4 Highlights Extraction for Sport Programmes Using Audio Event Detection. 7.4.1 Goal Event Segment Selection. 7.5 A Spoken Document Retrieval System for Digital Photo Albums.